Complete Shoulder And Hip Blueprint teaches you how to improve strength, mobility and durability, making the exercises easier or harder when necessary. The shoulders and the hips are two of the most important parts of the body. They control the function, endurance, resilience, and strength of pretty much your whole body between them. The shoulders command the upper body and the hips command the lower body. 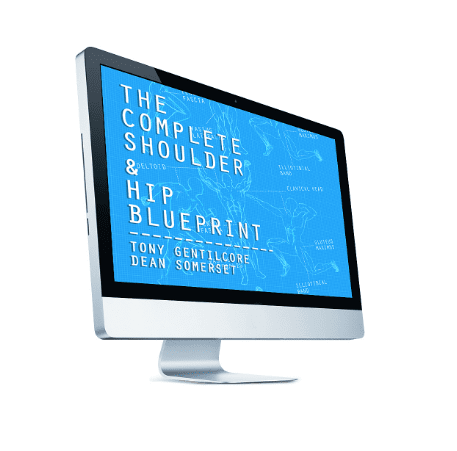 For a total workout that strengthens your shoulders and hips you should check out the Complete Shoulder and Hip Blueprint by Dean Somerset and Tony Gentilcore. When it comes to the shoulders the program shows you how your breathing mechanics, in particular moving your diaphragm, moves your upper body and keeps your lower body stable, as well as how to use this to your advantage. There’s also more on the importance of breathing itself, along with why thoracic, scapular and shoulder mobility is important. You’ll also learn more about “impingement”; including how to assess it, what the differences between internal and external impingement are, and how it can affect your training program. There’s also plenty of information on how to train an overhead athlete and their specific needs, along with how to tell the difference between an overhead athlete and other clients, along with how overhead mobility can be limited. Finally there’s also a guide to coaching and improving exercises such as push-ups and chin-ups, along with dozens of ways you can correct your form and the form of those around you. When it comes to the hips Tony Gentilcore’s the Complete Shoulder and Hip Blueprint shows you how training can be affected by the anatomical differences in people; how to spot these differences; and how to make the most of them. It’s important to consider these differences when helping people have the best squat and dead-lift stance for their needs. You’ll also learn how you can assess your clients and show them how they can improve, along with making use of passive, active, and compound assessments to understand just what a person needs to work on now to see the results they want. You’ll also learn the difference between structural, neural, soft tissue and motor pattern limitations to movement, along with how to put together a program to address any considerations that comes with this knowledge. Of course you’ll also learn plenty of ways to improve strength, mobility and durability, as well as how to make the exercises easier and harder when necessary. The Complete Shoulder and Hip Blueprint contains eleven hour-plus videos that show you all of this and more. It’s an ideal choice for personal trainers and individuals alike. As a personal trainer it can show you how to educate and interact with your clients to give them the best possible results. As an individual it basically allows you to become your own personal trainer. One great thing about the blueprint is that it’s entirely NSCA CEU approved. Going through the 11 “contact hours” will earn you 1.1 CEUs. All of this and more is included in the Complete Shoulder and Hip Blueprint. For added peace of mind you also receive a complete money-back guarantee backed up by Tony Gentilcore and Dean Somerset.